Here is Joe Foy, in his third and final season with the Red Sox. After the 1968 season, he was selected by the expansion Kansas City Royals. Joe was signed by the Twins in 1962 (I did not know that!) and played one season on their farm as a 1B/C. 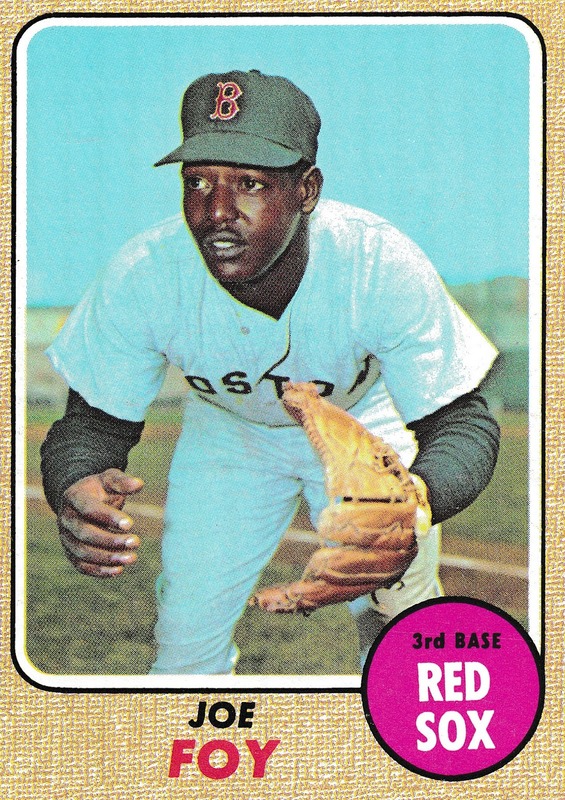 After the ’62 season he was drafted by the Red Sox in the minor league draft. In ’63 he moved over to SS and 3B, and was primarily a 3rd baseman during the ’64 and ’65 seasons. Foy made the Red Sox at the start of the 1966 season, and was the regular 3rd baseman from the get-go. The Sox had released incumbent Frank Malzone in November 1965, paving the way for Joe to start 139 games at the hot corner (along with 13 more at SS) during his rookie season. He hit .262/15/63 – not bad for a rookie. 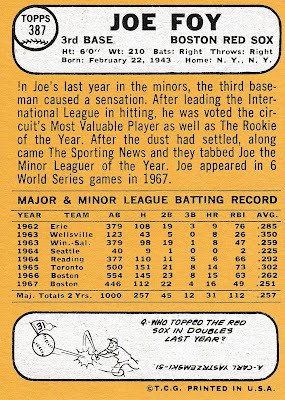 Joe started only 106 games the following season, as the BoSox acquired veteran infielder Jerry Adair for their pennant drive, and he cut into Foy’s playing time. Adair played a lot at shortstop in 1968, which benefited Joe, as he started 144 games at 3rd base. It was Foy’s last hurrah in Boston. After the season, both he and Adair were drafted by the Royals (Foy at #4, Adair at #51). In 1970 Foy started about 2/3 of the games at 3rd base, while 2nd-year man Wayne Garrett played the rest. 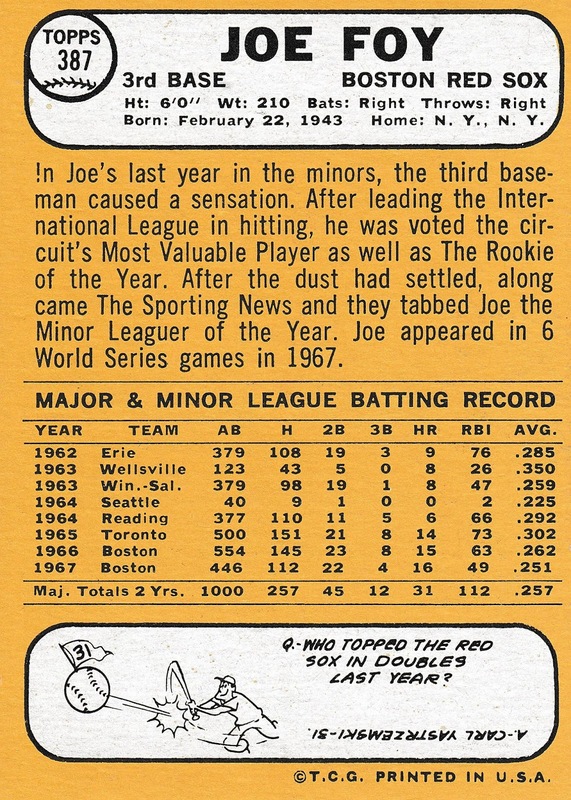 Joe’s numbers were way down from his years with Boston and Kansas City, so much so that he was available in the post-1970 Rule 5 draft, and scooped up by the Senators. Nomad Joe started 36 of the first 45 games in 1971 for the Senators, his last on May 27th. He was sent to the minors at the end of May, and after batting only .191 in 15 triple-A games was released in mid-July. Foy passed away in 1989 at age 46.